Did those epic videos of the tail happy 911 at SPA make you itch for a raw essential simple but effective sports car experience? Maybe those 2.0 SWB are not quite enough car for you and maybe a touch more reliability would be good. How about 1988 lbs with 270 hp ( that would be, for reference, in NASA GTS 4 territory)?. A car after our own hearts, but what would it feel like to drive? JustGoFaster.com friend and MSN Cars UK writer Dan Trent had a chance to find out a few years ago. Now that very car has come up for sale in the UK. Dan's write is "reprinted" after the jump along with that stunning 911's sale details. Dan's article originally appeared on MSN Cars UK in 2007. This car is currently for sale by Sean Locklear Specialist Cars. Not cheap but stunning....and in the perfect Axis color too! "..Built from a full stripped and acid dipped 3.0 SC. It now has a fully rebuilt 3.2 engine with PMO (46mm) Carbs. A 915 gearbox with LSD with full WEVO gearlinkage and internals to give excellent gear shifts. This car has been fully updated with Bilstein suspension, full SHROTH harnesses and leightweight seats. A full FIA welded in roll cage and fire extinguisher have also been fitted. The brakes are SC brakes but using Porterfield trackday pads. Fuchs 15" wheels 7 and 8 inch are fitted.."
A vision of the ultimate old school 911, the SL Clubsport has been put together by Porsche specialist Sean Lockyear. For the price of a new Cayman S, Lockyear will supply you with a built-to-spec retro 911 put together with all-new parts and set up to be the ultimate toy for trackdays or Sunday blasts. The idea is to offer the classic old school 911 experience in a package that's reliable, easy to work on and much more involving to drive than any modern Porsche could hope to be. Weighing just over 900kg and with 270bhp it has the ability to make even a GT3 RS feel a bit dull and lifeless in comparison. After years working in the trackday business Lockyear wanted to create a fast, thrilling car for owners who want to spend their spare time driving, not spannering. 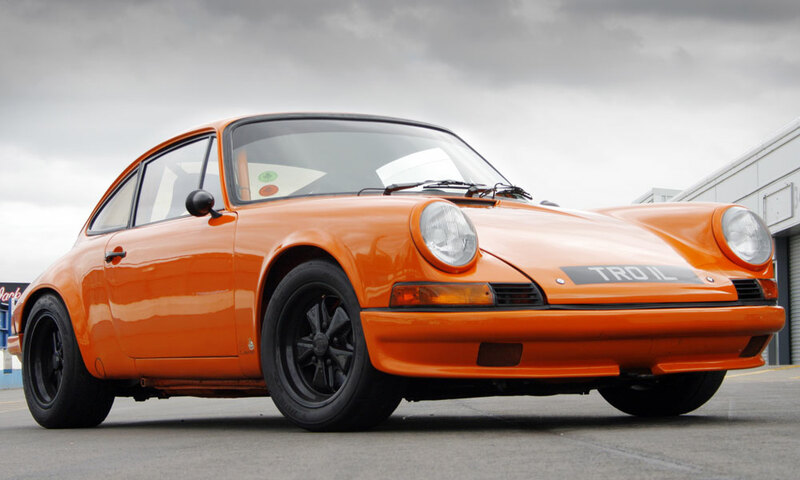 And with classic Porsches like the 1970s 2.7 RS now too valuable for most owners to take onto a track the SL Clubsport provides similar thrills at a fraction of the price. Think of it as a retro alternative to cars like the Ariel Atom or a highly tricked out Lotus Exige. It's nothing like as fast of course and demands a very different driving style but as a road legal track special it's aiming at the same market. With its full roll cage and stripped interior it's clear this car means business. But because they're built to individual requirements you could easily keep a few more creature comforts. Either way, the driving experience is decidedly old school. Which means it's very lively and demands skill to drive properly. But it's also very easy to feel where those limits are and learn how to make it work to your favour. It doesn't cosset you and it will bite back if provoked but if you relish a challenge it is an immensely satisfying experience. Driving a car like this reminds you how dumbed down modern cars have become. But the beauty of this old 911 is that all the parts are brand new and chosen for reliability above all else. And it's thrilling beyond belief. You very quickly learn to respect the relationship between the controls and how the car reacts, the information coming at you thick and fast. No modern car can hope to offer such an intense experience or teach you the importance of perfect throttle control and steering inputs. And while it's loud and intense you can also enjoy much of this experience on the road, without travelling at silly or illegal speeds. Creature comforts are, of course, limited. And with a stripped interior and no sound proofing you probably wouldn't want to drive it to work every day. But as we've said, you could easily choose a more road friendly spec and keep the full interior. Make no mistake though, this is a raw machine and with none of the safety systems we've all grown used to. So you'll need to learn to drive it properly or you'll quickly exit stage left backwards through a hedge. And while it has been set up to be as user friendly as possible it's going to demand a bit more care than a modern car to keep it in perfect fettle. In a word, thrilling. A car like this is the antidote to the monotony of modern motoring. And for something ready to hit the racetrack and fully set up for historic racing or rallying it's actually not entirely unsuitable for driving on the road. Lockyear has kept the traditional torsion beam suspension - albeit uprated with new Bilstein dampers and competition bushings - so the ride is actually rather civilised. And while the controls all have their own eccentricities like any 911 it's a car that shrinks to fit. And the fact it uses parts from established suppliers means any half competent Porsche specialist should be able to service it with no problems at all. Well it's based on an old car so you could argue this is a very glamorous and exciting interpretation of recycling. But that's about as good as it gets. The 3.2-litre engine runs a carburettor set up from US firm PMO. Which is great for power but means it likes a bit of a drink. And that rorty exhaust is also geared up for noise and power, rather than Euro IV emissions standards. It is very light though, so it doesn't go through tyres and brakes like a modern car. Fundamentally though this is about as far away from the CO2 obsessed mainstream as it's possible to get. Which is precisely the appeal for many people. Are you kidding? Of course we would. Although, even at our most starry eyed, we'd have to admit it's probably a bit much to run as an every day car. But the combination of classic 911 looks, a bullet proof build with modern reliability and a driving experience as thrilling as we've ever enjoyed makes this a very special car. If you could only have one Porsche for £45K a Cayman S would do you very nicely. But if you're lucky enough to be able to save one for weekends and special occasions this would be a fabulous choice. "you itch for a raw essential simple but effective sports car experience?" Makes me miss my 3.6 swapped 1980 911, extra raw and so much fun to push hard.